The cheapest Oral-B Electric toothbrush to come with Bluetooth technology and work with the Oral-B app. It contains all the necessary features such as a pressure sensor and 2 minute timer. It comes with a sleek charging station however it does miss out on a travel case. P.S. If you would like to find out my recommended electric toothbrush click here. 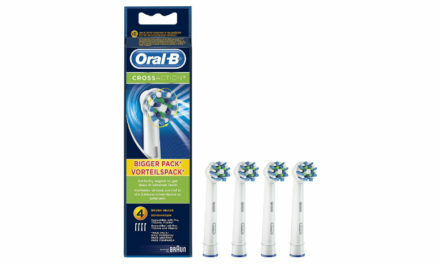 The Oral-B Smart 4 4000 Crossaction Electric toothbrush sits between the Oral-B Pro 3 3000 and Oral-B Smart 5 5000 in the Oral-B set up. It is the cheapest Oral-B electric toothbrush to have blue tooth connectivity which means it can connect with the Oral-B app. Does the features that Oral-B Smart 4 4000 offer warrant the price? Find out more in the detailed review below. 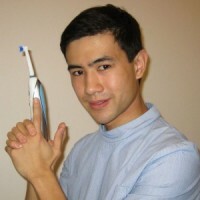 The Oral-B Smart 4000S which comes with a Sensitive or Sensiclean Brush Head. The only difference between these variants is the type of brush head it comes with. The electric toothbrush handle is exactly the same. My personal favourite is the Oral-B Smart 4 4000N as it comes with the CrossAction Brush head. The CrossAction brush head will be useful for almost everyone. The only exceptions are people with sensitive teeth or who like to press too firmly, then you should look at the Oral-B Smart 4 4000W. Let’s jump right into the Bluetooth connectivity as this is the biggest selling point with the Oral-B Smart 4 4000. This is a premium feature that is found on Oral-B’s top of the range electric toothbrushes. So what is it? 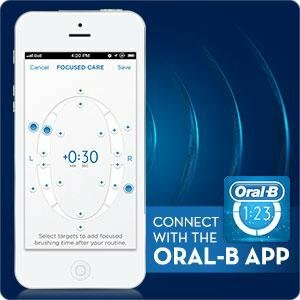 The Oral-B app tracks your “toothbrushing progress”. Once the electric toothbrush is connected to the app, it monitors when you have brushed your teeth, when you have pressed too hard on the electric toothbrush and offers professional guidance. We all know we are meant to brush for two minutes twice a day however this is not often done. The Oral-B app allows you to monitor your progress automatically and make adjustments accordingly. The handle itself is a fairly slim profile and comes in either a white or pink gloss finish which looks sleek. The slimline profile also makes it easy to hold. It is also rubberized which makes the electric toothbrush handle easy to hold even when wet. The on and off button which also controls the cleaning mode (more on this later) is very easy to press and very easy to change the cleaning modes. The handle is also waterproof so you could take it into the shower with you if you so wished. The Oral-B Smart 4 4000 comes with the standard Oral-B quad pacer 2 minute timer. I personally love this feature because it tells you when you need to change areas of your mouth. It does so by pausing for a fraction of a second. The average person typically brushes their teeth for only 45 seconds so the quad pace timer allows you to track accurately the amount of time you have been brushing for. The Oral-B Pro 4000 also comes with a pressure sensor which is a red light on the rear of the handle that flashes red when pressing too hard. This makes it very easy to see when you are pressing too hard and avoid causing damage to the teeth and gums. The Oral-B Smart 4 4000 uses the 3D Oscillating rotating method of action which is good. There is evidence that this cleans better than a manual toothbrush. 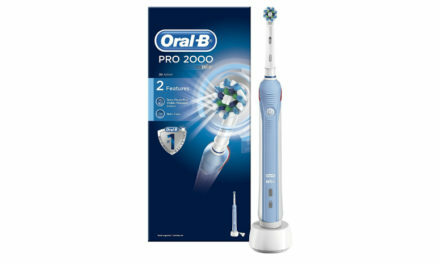 The Oral-B Pro 4000 oscillates at 40,000 oscillations and 8,800 pulsations per minute which is comparable with more expensive electric toothbrushes in the Oral-B range. It also comes with 2 different brush heads: Crossaction and sensitive. Both these brush heads are very useful. If you want to find out which my recommended brush head list click here. The Oral-B 4000 comes with four cleaning modes: Daily clean (the standard one), Gum care, Sensitive and whitening (only with the 3D white version Oral-B Smart 4 4000w ). The only added mode from the Oral-B Pro 3000 is the whitening mode which personally I think is quite aggressive. I would personally stick to daily clean unless you have sensitive teeth or frequently press too firmly when brushing. The sensitive cleaning mode reduces the oscillations and pulsations to 30,000 oscillations and 6,500 pulsations a minute. This coupled with a Oral-B Sensitive toothbrush head would be suitable for people who press too firmly or have sensitive teeth. The Oral-B Smart 4 4000 now comes with a new upgraded lithium ion battery that lasts for up to two weeks of use. This is a vast improvement over the “old” Oral-B Smart Series 4000 whose Nickel Hydride battery only lasted 1 week. When Oral-B say 2 weeks of use, this means that the battery will last for 56 minutes which is 2 minutes, twice a day for 2 weeks. The Oral-B Smart 4 4000 comes with the standard Oral-B Battery indicator which flashes when the battery is getting low. It has three green lights that sequentially decrease as the battery gets worn down, it is a useful feature however not as intuitive as some of the Philips range of electric toothbrushes. The charging station runs off the standard 220v -240v and is a very nice feature. Not only does it give you a place to put the electric toothbrush handle to charge but it also stores up to 2 electric toothbrush heads for you to use. I find this particularly useful if like me you share the electric toothbrush handle (please don’t share electric toothbrush heads). To use the charging station you will need a 2 to 3 pin shaving adapter. A good one can be ordered off amazon pretty cheap. No travel case with the Oral-B Pro 4000 which is strange as the Oral-B Pro 2500 has one and is cheaper. However it is fairly lightweight at 124g without the head. It is most certainly portable, you will just have to wrap it in some clothes when travelling to protect it or buy a seperate travel case which can easily be sourced on Amazon or online. Sitting at £54.92. 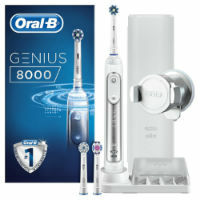 The Oral-B Smart 4 4000 does represent good value for money as it is the cheapest electric toothbrush to include blue tooth connectivity. I also love the charging station that can hold up to twotoothbrush heads. It is a shame though that it does not have a travel case, to get that you would have to upgrade to the Oral-B Smart 5 5000. I would recommend you check out my recommended list of electric toothbrushes. Is the Oral-B Smart 4 4000 suitable for children? The Oral-B Smart 4 4000 has not been designed with children in mind. If you want an electric toothbrush specifically for children, I would recommend you click here to check out my post on the best children’s electric toothbrush. Does it come with a smartphone holder? No it does not come with a smartphone holder. The Smartphone holder only comes with the Oral-B Genius 8000 and Oral-B Genius 9000. Is the Oral-B Smart 4 4000 waterproof? Yes it most certainly is and can be used in the shower if you want to. Is this Electric Toothbrush Noisy? It is not overly noisy when compared to other electric toothbrushes. If you are moving from a manual toothbrush you may notice more vibration and noise, however you will shortly get used to this. How do I change cleaning modes? You change cleaning modes by pressing the on and off button multiple times. The first time you press it, it will go to daily clean, the second time you press it, it will go to gum care, the third time you press it, it will go to sensitive and the fourth time you press it, it will go to whitening (only with the 3D white version Oral-B Smart 4 4000w). Is it safe to use on dental bridges/crowns/implants? Yes it is safe to use on dental bridges/crowns/implants. If the bridge/crown/implant were effected by the electric toothbrush, it was likely already previously damaged and would have failed anyways. 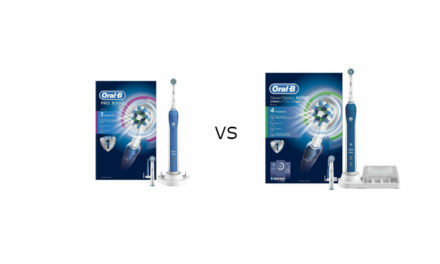 What are the differences between the Oral-B Pro 4000 and Oral-B Smart 4 4000? The Oral-B Pro 4000 is the old version of the Oral-B Smart 4 4000. The Oral-B Smart 4 4000 has Blue Tooth connectivity whereas the Oral-B Pro 4000 does not. Since the Oral-B Pro is getting phased out and is a very similar price to the Oral-B Smart 4 4000 it makes sense to buy the Oral-B Smart 4 4000. The Oral-B Smart 4 4000 also has a much better battery life. A very good mid-range electric toothbrush with a nice charging station and Bluetooth connectivity. It has a good mechanism of action and is fairly light weight and sleek in design. It comes with the most important features such as the 2 minute timer and the pressure sensor. 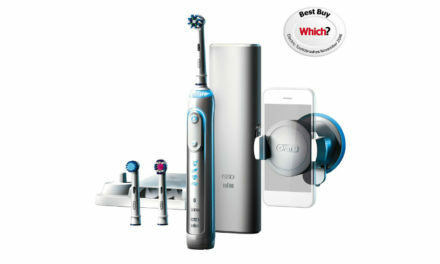 Summary The cheapest Oral-B Electric toothbrush to come with Bluetooth technology and work with the Oral-B app. It contains all the necessary features such as a pressure sensor and 2 minute timer. It comes with a sleek charging station however it does miss out on a travel case.